Blame it on the heat, being tired, or just plain not feeling knitty, but I was surprised to realize the other day that I had gone a whole week without doing any knitting at all. I did a tiny bit of spinning to ply up the next batch of MacGyver for Mike’s sweater, but that’s about all that happened on the fiber front. A whole week! Instead, I read a bunch of books. They’re a little better at consuming all of my attention (so that I can’t think about all the things I need to do for work and get sucked in when I’m supposed to be enjoying myself), and every once in a while I really just need to sit down and read for a while. That can be a little tough on the book budget, though – between Friday and Saturday I managed to finish one book, start and finish a second, and start a third. It is true what they say about the entertainment cost of knitting being pretty low for the hour. 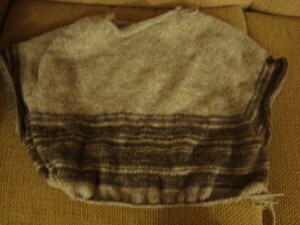 I’m now well into the main body section on the Mike sweater, and so far the yarn seems to be holding out. I’m about 10.5 ounces in and have another 14 left to go, so I’m cautiously optimistic that I’ll make it without further substitution. 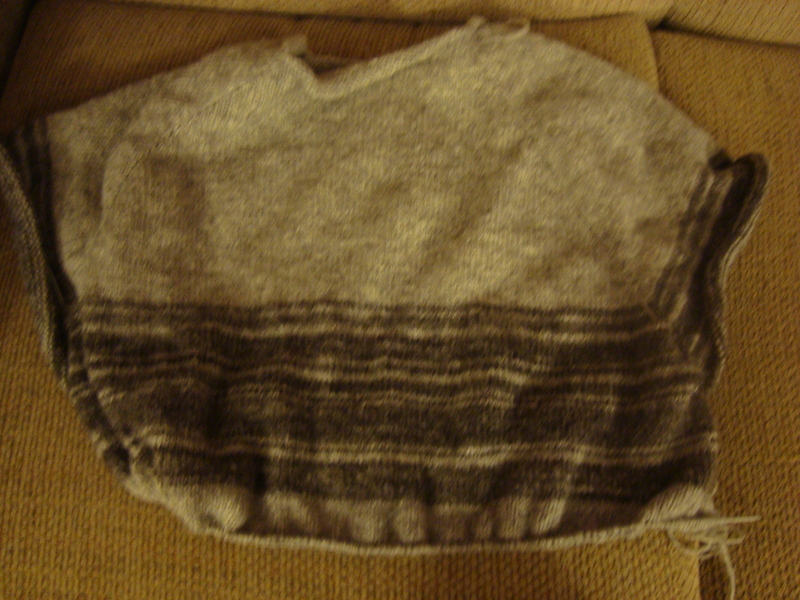 And so I calculate my way along, heading down the main body section of the sweater, and trying not to look at my empty spinning wheel. Some things are just too good to resist. The sweater is looking exceedingly handsome. 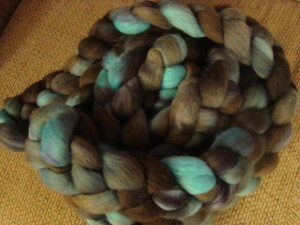 But I can’t wait to see what you spin up out of that roving – it is stunning. I could just roll in that roving!!! Mike’s sweater is looking great. We all need a little down time or a little respite from all the other stuff we do. I’ve been doing a little reading too. It’s been beastly hot here for so long I only go out in the early a.m. to water the flowers and come back in to wipe my drippy face. The heat this summer’s really taken a toll on my knitting too. It’s no fun to knit when the yarn just sticks to my hands. I like how the striping turned out on Mike’s sweater. An inch per hour sounds like good progress to me! DesigKnit is powered by	WordPress 4.8.9 . Page generated in 0.275 seconds using 36 queries.